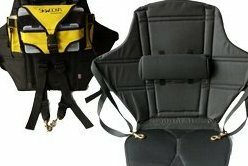 Kayak Fishing Seat with lumbar support - full width and adjustable. Genuine Skwoosh TekPad Gel Cushion with AIR-Flo3d breathable fabric. Comfortable - 20" back with adjustable side wings and hi-strength attaching straps. 2 Rod Holders with security straps and detachable tackle pack includes Plano utility boxes. MADE IN America.